MC-5100 in a Paronelli bulldog. Just finished smoking Sutliff Black Cordial in a straight 1979 MM Legend. Next is Mystery Blend #2 in a 2003 IMP horn Meer. I have no idea what it is that I'm taste testing. Brown Irish X in a Dunhill Root bulldog. Jim's Va./UnBur #1 in my trusty 1970s smooth three quarter bend Peterson System Standard 305. Carter Hall mixed with GH&Co Rum Twist in a cob. Kendal Kentucky in a Charatan Lane 2502X. 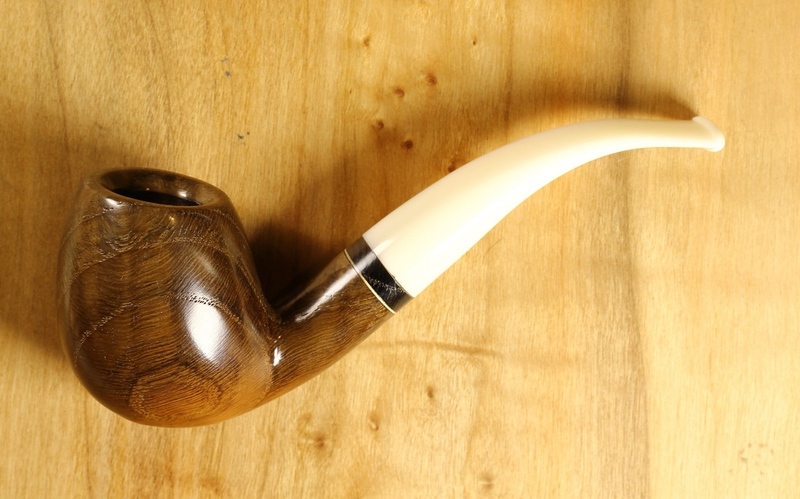 Mystery Blend #3 in a 1975 medium bend sandblasted looking, smooth on the sides yellow Pioneer meer. I think I know what this one is, but I can't say. Mystery Blend #1 in a 2002 IMP smooth full bend egg shaped meer. Listing this one a little early: Jim's VaKy in an early Radice Tiger Eye G medium bend pipe with a bamboo-style carving on the shank. Darbyshire is a MM Great Dane Egg. Mystery Blend #2 in a 2003 IMP horn Meer. Still trying to figure this one out. Smoker's Haven In-B-Tween in a 2004 smooth long stem Canadian Trever Talbot Ligne Bretagne Faite en Bretagne 4/3. Pepe's Favorite in a straight grain Comoy pot. For the start of this rainy day it's Steven Books First Pipe in the Davorin Morta Bent Egg, black Ugandan coffee for the ride in. Newminster No.403 Superior Round Slices in an Ooooold Cob with a bone bit. Tasty to say the least, sweet and woodsy. A little BBF (just about the last of it) in a Dunhill.